The second semifinal of the 2015 FIBA Americas Women’s Championship will have the hosts Canada battling traditional powerhouse Brazil for a spot in the finals of the competition. With the end of the Group Phase, the Semi-Finals and the 5th place game have been configured. The last day of the group stage in 2015 FIBA Americas Women's Championship ? ?features four deciding games relevant to either the seeding of the semifinals or to determine the two teams that will play for fifth place and the last spot for next year's FIBA ? ?Olympic Qualifying Tournament. The fourth day of the 2015 FIBA Americas Women's Championship finished with confirmation of the four teams that will play in Saturday's Semi-Finals as Argentina, Brazil, Canada and Cuba all did what they needed in order to move on to the next phase. The third day of competition in the FIBA Americas Women’s championship had every undefeated team of the tournament adding to the win column. Luiz Zanon’s team added another win after defeating Ecuador, 72-45, to get a 2-0 in Group B of the 2015 FIBA Americas Women’s. The first day of the 2015 FIBA Americas Women’s Championship handed victories to the National Teams from Chile, Ecuador, Brazil and the host, Canada. After being close for three quarters, Brazil pressed the accelerator in the fourth quarter to defeat Venezuela, 86-71, and close the first day of the 2015 FIBA Americas Championship. 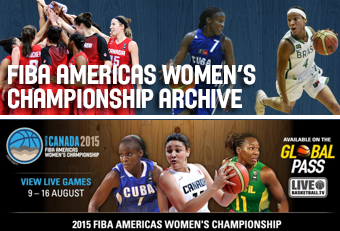 ¡The 2015 FIBA Americas Women’s Championship has officially begun! The Saville Community Sports Centre in Edmonton, Alberta, Canada is ready for tip-off of the 2015 FIBA Americas Women’s Championship where 10 national teams from around the continent will play for the title of the best of the Americas and a spot to the Olympic Games in Rio de Janeiro 2016.